It pains me to say, but all signs are pointing to Mats Zuccarello being traded at the deadline. Now it is entirely possible that he re-signs in the summer, like what Keith Tkachuk did with St. Louis after being traded to the Atlanta Thrashers. While that can certainly happen, the focus will be on what Zuccarello can fetch in a trade. The best comparison we have for Zuccarello is something that fans should remember vividly, and that is the Rick Nash trade to Boston. That trade fetched a 1st round pick, a 7th round pick, a solid but not top prospect, and two roster players to offset salary (Ryan Spooner, Matt Beleskey). The Rangers also retained 50% of Nash’s salary. Ignoring the players to offset salary, the value is set: A first round pick, a late round pick, and a solid but not top prospect. Given Zuccarello’s salary of just $4.5 million, the need to retain salary likely isn’t there, but it’s something the Rangers could do to sweeten the pot. After all, more salary room ($2.25 million, to be exact) goes a long way for a contending team looking to make another splash. Teams looking to add Zuccarello are looking for a top-six winger to fill out their roster. These are teams that are a little top-heavy, but have the potential to be true contenders if they make a move or two. Or, in some cases, they have the potential to still be in the running despite being flawed, like the 2016 Ottawa Senators. The Avs fall into that latter category. Outside of the MacKinnon-Landeskog-Rantanen connection and a great season thus from from Semyon Varlamov, the Avs have no real business being in second place and ahead of the Winnipeg Jets. They are in the position they are in, though, and will likely be looking to shore up their forward depth, or lack thereof, at the deadline. The Avs are also in a great spot with Ottawa’s first round pick this year, in addition to their own. It may make them a little more loosey-goosey at the deadline, since they have a lottery pick in the wings. 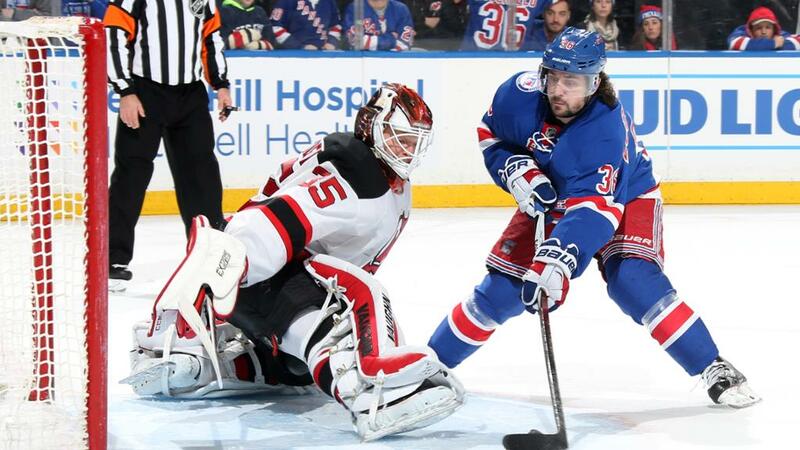 And no, the Rangers won’t get that lottery pick for Zuccarello. So don’t bother with the pipe dream. In terms of prospects, Cale Makar is probably off the table. The next tier has three guys that Corey Pronman lists as legit prospects though, in RW Martin Kaut, C Vlad Kamenev, and D Conor Timmins. Kamenev is currently on the NHL roster, so let’s just scratch him, as teams rarely subtract from their current roster. The Rangers have a habit of targeting heady players with complete games, and both Timmins and Kaut fit that bill. Neither has elite upside, but both are solid. In this situation, I’d prefer Timmins, but either will suffice. This is a team that is lacking just one top-six forward. They are a legitimate contender who likely need a 2C more than they need Zuccarello (they’ve been linked to Kevin Hayes), but that doesn’t mean they won’t be looking to add insurance. They have their first round pick and the cap space to make it work, too. They also have a trio of solid-to-very-good prospects in winger Kristian Vesalainen (1st, 2017), defenseman Dylan Samberg (2nd, 2017), winger Mason Appleton (6th, 2015), and center Michael Spacek (4th 2015). Vesalainen is the best of the bunch, but the other three are solid prospects too. Given how the Rangers have been targeting defensemen in trades, I can see Samberg as the target here. Appleton is with the club, and Samberg is a little bit better than Spacek. Their window is closing fast. If the Jets make a move to solidify their forwards, I can see Nashville doing exactly the same thing. Heck, maybe both teams pluck players from the Rangers. Cap space isn’t an issue for Nashville, and they have their first round pick. If the Predators are going to win, they need to do it soon. Keeping with the defenseman theme, Dante Fabbro is probably the best prospect in Nashville not named Tolvanen. He’s another solid defenseman who isn’t elite level, but overall good. If the Rangers want someone a little more NHL ready, then Frederic Allard, currently in the AHL, could be a target. He’s the opposite of Fabbro, with great offensive ability, but struggles in the defensive zone. Given how the Rangers lack in offensive defensemen outside of Tony DeAngelo and Neal Pionk –neither are guarantees– they could use someone else here. "A peek at trading partners for Mats Zuccarello", 5 out of 5 based on 10 ratings. Hayes would be perfect for the Jets (Hayes and Skjei for Trouba) and Zuc would be perfect for any playoff contender looking for top 6 help, or even 3rd line scoring depth. It really comes down to the highest bidders this trade deadline. And I think that both will be highly sought after, putting the Rangers in a pretty good spot to gain more younger assets. For McQuaid, the Rangers will be lucky to get the 4th round pick back that they gave up to get him. Brilliant!! That trade I’d make in a heart beat!!! Then all we would need is a sniper, or two…………. ADA in place of Pionk, and or Miller, WOW!!!!!!!!!!! I expect Miller 2-3 years from now. If the early promise pans out, Miller could be a beast of a defensman. He is definitely at least 2 years away, probably 3, but I think they may have sniffed out a terrific prospect there. yep loved that pick for sure. I agree Hayes would look good with the power house Winnipeg Jets and on a line with quality linemates like Laine and Ehlers. JG will definitely try and get this extension done soon so I don’t see that trade happening. Btw if the Jets were to trade Trouba than he would be on a fast track to Detroit. we will find out soon enough bro. Overpaying for Trouba tbh, we can get more assets for Hayes and Skjei in separate trades. Besides, that leaves us with one RD too many — unless you have a nice trade lined up for ADA, Pionk or Shattenkirk. I would also be concerned about the hole you’re leaving on the left side. Skjei may not be #1LD material, but he’s the best we have on the left side at this time. There’s some sort of love affair with Trouba in RangersTown. Give me a long dated 1st round pick on any of these teams; if I have to retain salary(would leave 1 slot open, but return to 2 at season end) I’d want more in return. Don’t need signed prospects back right now as all it does is make for expansion headaches. I would be more interested in getting 2021 & 2022 first rounders to sure up the future for a Zucc deal. I wouldn’t be shocked if the NJ Devils sniff at Zucc. He may be the 2nd line addition they need, if they are in a playoff hunt. Either way, both Zucc and Hayes need to go to the highest bidder.. We are not winning anything this year with them so let’s turn their picks into future HOF’s. Unless Gordie picks more goalies with second round picks. this is a deep first round apparently. ive seen the guys from 3-15 ranked differently every week and some slip in the draft.therefore even a late first wouldn’t be so bad as long as it isnt traded for woof lindbolm. I believe Nash’s overall value was driven by his strong 2-way play but mostly by his reputation, either real or perceived, as a scorer, by his size, and his positive mojo. I love Zuke and as good as he is as a team guy, IMO he unfortunately does not carry the value that Nash had. However if the Avs have an interest then, as I have said before, it should be Gort’s sole mission to put together the blockbuster pieces that will net the Sens #1 pick. I don’t know what that looks like but Zuke, Hayes, and one of the young D-men on the farm could be a starting point. I like this – going for an elite player instead of a number of middling prospects. And it might be reasonable for the Avs, as Hayes and Skjei are young. Big issue is whether or not they like Skjei. I do not see any way they move that pick maybe if you threw in krieder, Kravtsov, and Skjei too they might consider it With our luck it would wind up outside the top 5 picks lol. We need to stay away from Pro prospects in the return unless it is a can’t miss player. Otherwise either high end College players or picks need to come back. I wouldn’t mind moving Hayes for a first round pick and consider resigning him in the summer. I don’t see Panarin coming to the Rangers as a done deal at all. It would be great if it happens, but I’m not holding my breath waiting for it. I can see Zucc and Hayes being traded, but there’s no need to hurry. Let’s wait for someone to make an offer we can’t refuse. I”d also like to see what we can get for Pionk. He’s great on the PP, but a major defensive liability 5 on 5. We also have Shattenkirk and Tony D to fill that role. Actually, any one or two of those three could go for the right returns. It seems like scoring D-men are more readily available these days than defensive gems. And, like others have said, we need to be really aware of the expansion draft situation with any changes we make. It’s not just not picking up anybody who needs to be protected, but also making sure that we have enough expendable players available. Kreider, Hayes, Zucc to the Avs for both 2019 first rounders, Cale Makar, a body back for cap reasons, and a mid round pick (or meh prospect). Igor Eronko who is a Russian contributor to NHL.com says that Kravtsov is coming to North America after his Russian season ends. North America could mean AHL or the big club. I would have to think that he at least gets a sniff of MSG, but please don’t burn his first year ELC…. Zucc knew he was a goner because the management has already expressed how much they wanted to resign his buddy Hayes. If I was him and saw JG, Drury, Quinn and Sather talked about a extension for Hayes, than you know long term where you stand. It is what it is, Zucc will be missed but it’s not like he’s a 26 yr Derek Stepan or spring chicken. Props to the Leafs for signing Nylander to the type of contracts I’ve been banging on about here for a while: front loaded 2nd contract that make it tradeable for quality assets before the NTC kicks in. It allows the team to rotate assets while keeping their core young and the window wide open until the get a lineup they really like, then lock in. Toronto’s problem is that the cap hit for Nylander this year makes it improbable that they can extend either Matthews or Marner(let alone both) and that is what you call playing with sodium in the rain. Life is complicated and the salary cap needs to be considered, but personally I would rather have Zuccarello than both Hajek and Lindgren. Zuccarello is a not too great first line winger whereas I see the other two as part of the supporting cast. I don’t see that duo as any more useful than Grabner or Claesson, players you can get if you need them. Why is this relevant? Well, it seems to me that the package you are proposing to acquire is a lot like Hajek and Lindgren – a low first rounder and another prospect certified to not be top level. To be competitive, the Rangers need first line forwards and top pair defensemen and those don’t appear no matter how many non-grade A prospects you acquire. Sorry Ray, but I believe your dead wrong on Hajek, and possibly Lindgren as well. Lindgren is more of a stay at home guy, tough as nails, but Hajek can skate, plays solid shut down defense, and has a cannon for a shot. These guys will be on the big club within a year or so!!!!!!! Walt,Hajek does skate well and is a good playmaker,he’s a talented offensive dman,but his defensive play at this stage of his development is far from shut down. Not from all the reports I’ve read on him. He almost made the team coming out of camp, and the only reason he was sent down was we had to protect some of the other d-men, or lose them to waivers, such as ADA for one!!!!!!!! No worries Walt, you’re spot on re: Hajek. In all honesty if not for the fact that we have Staal as the captain and Skjei, Claesson and Smith on the left side, then Hajek would have made the team out of training camp. For now he’s best served playing in the AHL for some seasoning, but all indications are that he’s going to be a good one. I was not saying these two guys were flops. I certainly think one or both has a very good chance to make the Rangers within a year or so. The question to my thinking is whether they will end up as first pair, second pair or third pair guys. If Hajek is first pair, than I am misreading and my conclusion is certainly wrong. If these are two future third pair guys, I think the Claesson signing shows that you shouldn’t give up very much to get such players. If they are second pair, well things are less clear. Of course, I was really less concerned with these players themselves, just observing they are at about the level that Dave would get for Zuccarello in his expected trade. Who wouldn’t want a soon-to-be 32-year old 5’8” winger over two young defensemen? Who can both skate and hit and are 20 years old? And whose first two years of service as Rangers will cost less combined than the aforementioned aging forward? Oh that’s right—nobody in their right mind would want that, that’s who. I could be quite wrong, but I suspect that the Mighty Zuccarello might be more valuable to the Rangers than to other teams around the league, so I am not sure that the Rangers will be offered a lot for him. If so, then the question becomes: Do they want to re-sign Zucc and have him around for a couple of years on a reasonable contract while they continue the rebuild, or would they rather trade him and get something for him now? The Rangers are pretty thin on the wing at the moment so I’d think that they might need one in return for Zucc. I guess if they are offered a young winger as part of the deal it could make sense to give it a shot. Your first paragraph may be correct. Which is why gorton probably couldn’t justify dealing him last deadline. However I have issues with your second paragraph. You know zucc isn’t playing bottom line minutes where ever he ends up. So how on earth do you plan on getting enough time for chytil, kravtsov, howden, lias buch etc. that’s on top of panarin?. that’s on top of reduced production and now health issues. (And yes im sick of seeing a 5-8 guy take ‘slappers’ from beyond the circle on the pp – fans wonder why we cant compete with the jets) Gotta learn when to Move On. take what you can get. Call up a meskanen if necessary. I was really only posing the possible routes they may take in my post based upon my opinion that the market might not value Zucc as much as the Rangers have valued him. In my opinion, despite my love for Zuccarello over the years, they should probably trade him. Secondly, if they were to re-sign him because of a perceived lack of forward depth, then I’d hope for a very limited contract, maybe even a two-year deal. But if they have some youngsters they think they can bring up (like Meskanen) then why sign a 32 year-old at all? With that said, I think they probably have to trade him and get something. Hopefully a young winger. I am having a hard facing up to the fact that Zuc will no longer be a Ranger. Re-sign Hayes. Chytil is a winger. Do we expect Rykov and Kravtsov to be playing in Hartford this year after KHL?